One of these days I'll put in more effort to take better pictures of my knitted works. It's just that little cell phone happens to be so much more handy. I've been working on a new baby cardigan. Shocking, I know. I seem to have a small obsession with cardigans. This is a project I am exclusively knitting at the moment. For many that is a "duh" statement. Who knits more than one thing at a time? Actually I do. I knit between 5 and 20 different projects at a time. One of the many disadvantages of knitting so many things at one time is finishing quickly. This particular project is intended for a friend. Her daughter was born late spring and I had every intention of getting the knitted something underway well before the baby came but that didn't happen. I selected a few beautiful cardigans that were delicate and so very feminine. 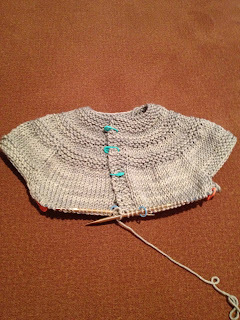 As time got away from me I realized that a lace based cardigan pattern as beautiful as it was would not be complete fast enough. I decided to find another pattern that would knit up quickly. 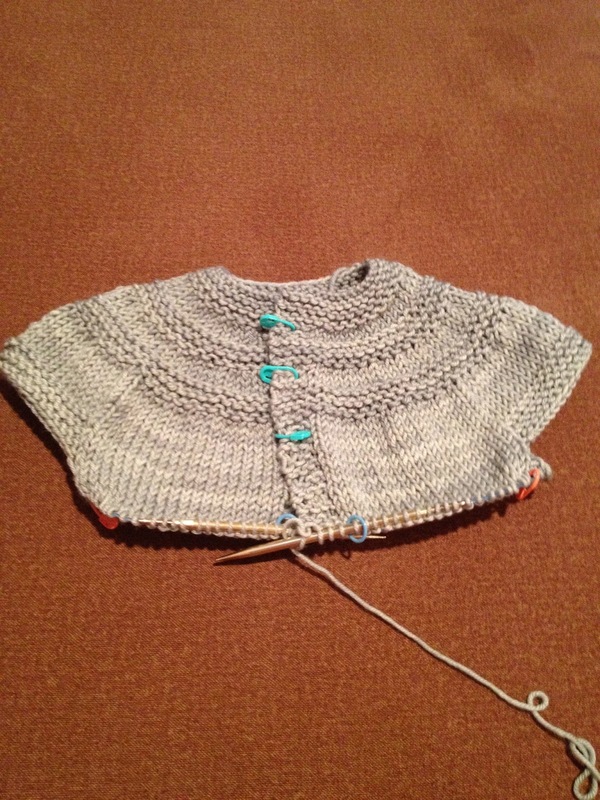 I cast on weeks ago (Early June) and finally crossed over into completing the first third of the cardigan. If you are a Ravelry user you can check out the pattern I am using it's the In Threes baby cardigan. A simple sweet cardigan that is just the extra layer a baby girl needs to be super cute. I'm using Madeline Tosh Vintage in Thyme. This was one of the substitution yarns for the recommended Malabrigo merino worsted. The Thyme is a lovely light shade of green perfect to pair with all the pinks and purples a little girl wears. I'm sure there will be plenty of pink given this darling girl has two big brothers. So far the newborn size with the MT vintage is turning out to be far larger than the author indicated. Far larger than I anticipated. My gauge is spot on so it's really a matter of yarn disappointment. I assumed the cardi would be bigger as the MT vintage tends to expand garments. I hoped that by going with the newborn size using the MT vintage that the cardi would be a 6-12 month size. My trained eye tells me this will be more of a 12-18 month size. I daresay even my Adelynn close to 36 months might be able to squeeze into it. Oh well a bit bigger will work just fine, something for baby to grow into. I'm pressing on despite my wishes to gift a smaller sized sweater. Once I finish this sweater I'll try a different yarn with the newborn size to see if that will make a difference.